Check out these great fly fishing spots in Virginia! I’ve never met a trout I didn’t like. And though I’m not sure how trout feel about me, I get to meet a lot of them in the Shenandoah Valley. From Alleghany to Rockbridge, the valley is home to wily brook trout, colorful rainbows and hard-to-fool browns. And fish are everywhere. Thin blue lines cross maps of the region in every direction. While it’s hard to go wrong looking for fishing spots, some are better than others. The ones below are my favorites. So grab your rod, belt on the waders and start casting. Take Interstate 64 exit 27 to Clifton Forge. From there, take a right on Route 60 into the town. Make your way through the town with a right on Commercial Avenue, a left on Revere Street then another quick right onto Route 606. Follow 606 until you bear right onto the water plant access road. When you have trout water like Smith Creek nearby, it’s hard to show up for work. The creek is dangerously easy to get to, has some beautiful fish and, for some reason, isn’t crowded. The Alleghany creek flows into the Jackson River near the headwaters of Virginia’s James River. It’s dammed a few miles above Clifton Forge, and trout runs from the reservoir mean fish are plentiful. A trip to Smith Creek gives you plenty of choices. You can test yourself against some bigger fish south of the dam, go after stocked trout in the creek north of the reservoir, or head farther upstream and hunt wild brook trout. If you’re chasing a big trout, park at the entrance to Clifton Forge water plant and hike the one-half mile downstream to the artificial lure only section. Here, you’ll find deep pools that shelter larger trout. Try dragging streamers like a Black Wooly Bugger near the bottom of these pools. An 8-foot leader and a longer rod will help your flies reach the fish. Upriver from the dam and reservoir, the Virginia game department stocks the creek. Here, the water narrows and provides fish with deep, well-shaded pools. In the spring, I’ve had success with a size 16 elk hair caddis or a 14 to 16 pheasant tail nymph. Fish here can be smaller, but there are bigger ones out there. On my last visit I nearly stepped on a 12-inch trout. Farther upstream, road access to the stream is limited and hatchery trucks can’t stock the water. 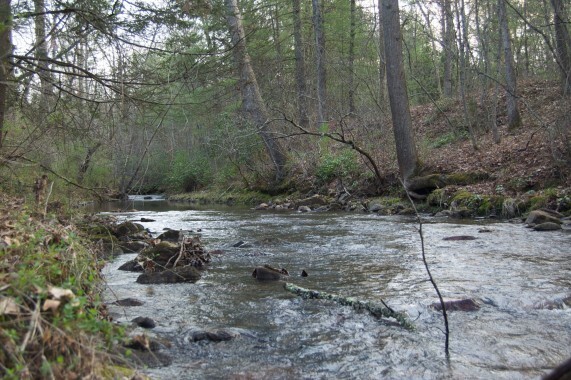 In this section, you’ll find clear water and native brook trout. From Interstate 81 take the Lexington exit. From there take Maury River Road (Route 39) through Goshen Pass. Shortly after the Boy Scouts camp, you’ll see the Guys Run access road on your left. If you’re looking to get away for an afternoon, grab your rod and head to Guys Run. 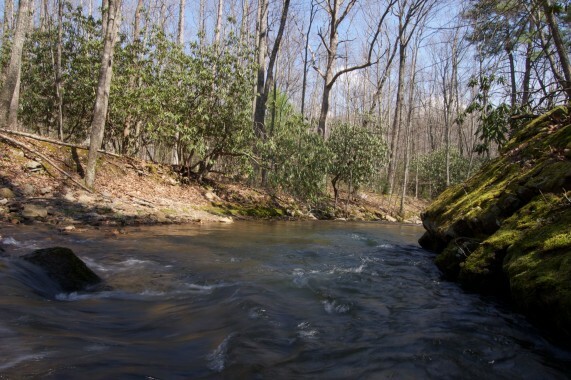 The small brook gathers water from mountain streams in the Goshen-Little North Mountain Wildlife Management Area and carries it into the Maury River and out through Goshen Pass. The stream is a short hike from the access road. You can drive to the top of the access road and fish down, or park at the bottom and work your way upstream. Guys Run stays small, so you’ll be doing more hiking than casting. But even with the all the bushwhacking, fishing here is a blast. The small brook trout come out of nowhere and explode onto your flies. Sneak up on their smaller pools and throw a 16 to 18 Caddisfly or Blue Winged Olive. If you’ve made four casts and haven’t gotten a strike, it’s probably time to move on to the next pool. Brook trout here are smaller, but it’s possible to take a six to eight inch fish on a great day here. Best of all, I have yet to run into another fisherman while at Guys Run. Take the Interstate 81 exit to Lexington, Va., then follow Route 39 west past Goshen and through Warm Springs to Route 621. Turn right on 621, then follow a Hidden Valley park sign and bear left onto Route 615. Stay on 615 until the road ends in a gravel lot. In addition to the state fishing license, you’ll need a national forest use permit to fish the Hidden Valley. In 1858, Judge James Warwick built his mansion in the Jackson River’s secluded Hidden Valley. The Warwick estate has been restored as bed-and-breakfast, and to this day it remains some of the only evidence of civilization in the Hidden Valley. Leave behind Warwick’s mansion, and you’ll find yourself with only a few trails and some of the best trout fishing in Virginia. After arriving at the Jackson, take the trail to the right and trek upriver. The initial stretch of the river is stocked regularly in the spring, but fished out quickly by spin casters with live bait. 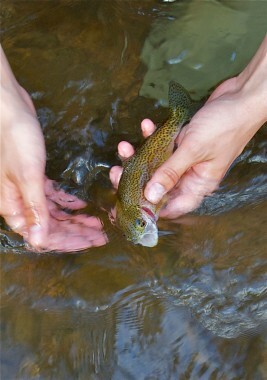 If it has been stocked recently, rainbow trout sit in deeper pools along the far side of the river. You can land one by wading out and throwing streamers like a number 9 Black Wooly Bugger. If you’re after risers, wait until near dusk when large numbers of mayfly spinners draw the fish to the surface. Try a Quill Gordon in March and April. But if you can resist the urge to start casting right away, keep hiking upstream to the suspension bridge and the artificial lure only section of the river. The farther upstream you get, the better the fishing. I spent my entire afternoon near Muddy Run without running into a single fisherman. In the special regulation area, holdover rainbow trout can grow as large as 20 inches. Fish in this part of the river enjoy the cooler water from springs that feed the Jackson. Wade out and feel for these cool spots, then start casting. Later in the summer, fishing in the Muddy Run area can be spotty. Anglers report that the game department has had trouble stocking in the past, and high water temperatures can limit fishing. Take I-81 exit 205 to Steele’s Tavern and turn right on Route 606. Follow 606 until it intersects with Route 11. Turn right at Steele’s Tavern onto Route 56 to Vesuvius. 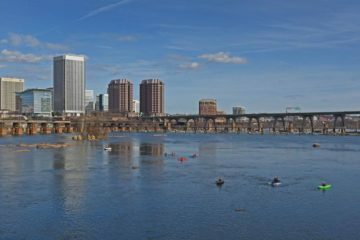 Cross the South River, and then make a left onto Route 68. Follow 68 as it makes a right and passes under a railroad trestle. Not far after the trestle hang a right onto St. Mary’s Road (Route 42). Follow St. Mary’s until it ends in a parking lot. Step into St. Mary’s and it’s easy to see why the river was once considered by many to be the best fly fishing spot on the East Coast. As the creek makes its way though one of the most scenic canyons in the state, it once provided ample populations of rainbow and native brook trout for anglers from all over the country. Unfortunately, mining in the canyon and acid rain have damaged the stream. As the pH dropped, trout population and the stream’s productivity suffered. In 1999 the game department helicoptered in 140 tons of limestone sand to help restore the water. Results have been promising. St. Mary’s now sports a large population of hardy brook trout, and has recovered much of its former productivity. The creek is a challenge to fish. The creek bottom is mostly quartz, and it’s easy to lose your footing on the slick rocks. Use the trail along the side of the river or expect to go hip boots over teakettle a couple of times. The brook trout are small and spook easily too. But if you can land a wild brook trout in St. Mary’s, the work is well worth it. Wild brook trout are the greatest treasure of the Shenandoah Valley. Catch them with precise casts to the vegetation-covered pools near the sides of the stream. I’ve had success with flies like a size 12 Elk Hair Caddis or a number 16 Adam’s Dry. Some anglers report success using smaller Copper John nymphs as well. St. Mary’s is best fished in the early and middle spring. Later in the season the stream’s water temperature rises and the water level drops. Keep an eye out for rattlesnakes too. Take I-81 to Lexington, then U.S. 11 south to Route 251 towards Lake Robertson. Once on 251 continue onto Route 677 and take a left at Route 612. The special regulation area runs upstream from 612. To fish Buffalo Creek, you need a free permit from the VDGIF. You can get one by sending a self-addressed and stamped envelope to Virginia Department of Game and Inland Fisheries, Fisheries Division, P.O. Box 996 Verona, Va 24482. Buffalo Creek is an easygoing stream. It wanders through farms and pastures, gathering width as it collects water from springs in the area. The creek’s painless access right from the road welcomes anglers, and open spaces forgive errant casts. Most enticing, though, are the trout. Springs keep the water cool late into the summer, and the large numbers of insects keep Buffalo Creek’s trout well fed. The fish grow quickly, and it’s not uncommon to hook a 17-inch prize in this section. But because of the creek’s popularity, fish here tend to chuckle at poorly presented flies. You’ll have to work hard to land one. In the early spring, caddisfly hatches happen along the stream. Fishing smaller pools with a 16 to 20 Blue-Winged Olive or a 12 to 14 Quill Gordon is a safe bet. There are days on Buffalo Creek trout just won’t take dry flies. If you’re getting skunked, tie on a nymph and see if your luck improves. If you’re after a bigger fish, tie on a black streamer like Shenk’s Black Sculpin and head for some wider sections of the stream. You might end up with a trophy, but don’t be surprised if you come back empty-creeled. Large privately owned areas make fishing on Buffalo Creek complicated. Take note of posted signs; owners tend to take them seriously here.